Jay Foster and Mike Nappi will be sitting in with the “Electric Bakery” today at the 30th annual Savin Rock Festival in West Haven today. Mike was one of my first victims in series of live musician drawings and paintings I started years ago. That series led to my long involvement with working with musicians as subject matter. That in turn, led to a tangent of band photography, promotional design, and aspects band managing. Managing musicians is like herding cats! Very fun but I’ll stick to the visual aspect! 15 years.This has provided me with free models though not necessarily still models!Drawing the moving figure has been great practice! 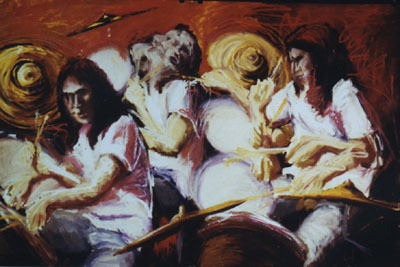 The characters in the painting from left to right are Dan Sharkey, Sean Lynch, and Jay Foster. Mike is a seriously great drummer and has a pretty extensive resume. This is from his “myspace” profile: "Over the years of playing drums I have been honored to have the opportunity to Perform/Record/Tour Internationally and Nationally with some of the most amazing artist's, musicians, producers etc.. Such musicians/artists as...Kal David, Lucky Peterson, Kim Waters, Ira Coleman, Joe Diorio, Tony Marino, John Ellis, Pete Levin, Adam Klipple, Tony Kadleck, Bill Crow, Rohn Lawrence, David Berkman, Itaiguara Brandao, John Di Martino, Will Boulware...and many more...... Producers: Jay Newland (Norah Jones)...Jimmy R. Landry...(CherryS/T,Barry Manilow)....Greg Wattenburg (Five For Fighting)...Chris "Big Dog" Davis (Najee,Will Downing)....Dale Penner (Nickelback)....."
So come on down and check them out. Alex Alves, from the “Electric Bakery” and “Melon Kali Flowers”, will be giving away some very cool T-Shirts and promotional items of his design. They will be playing from 3:30PM – 4:30PM. Get there early!!!!!!!! 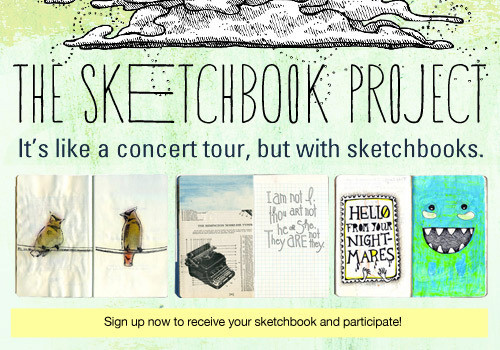 If you happen to be in Winter Park, Florida tomorrow, you really should experience the Art House Co-op’s Sketchbook project exhibition. 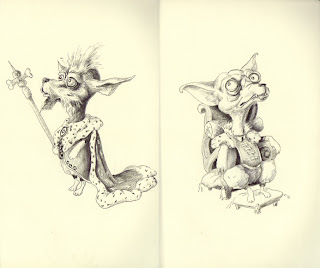 My book “It’s Reigning Cats and Dogs” will be available for checking out. If you can’t make that gig then you will have a chance to view this year’s tour at the Brooklyn Art Library in NYC, where the work becomes part of the permanent collection later this summer. My other book “For the Trees” is housed there also. 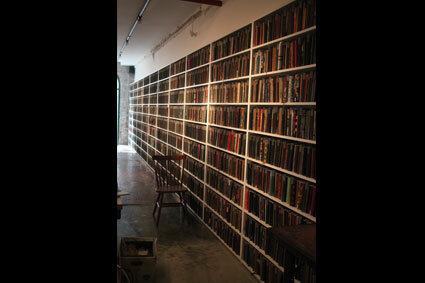 This year’s tour started in Brooklyn at the Brooklyn Art Library. It then traveled to The Austin Museum of Art in Austin, Texas, remaining in Austin, it was exhibited at The 29th St Ballroom at Spider House. Zigzagging across the county the exhibition opened in Portland, ME at the SPACE Gallery, then down to Atlanta, GA at the The Granite Room, up to Washington, DC at The Hillyer Art Space,then back over to NY in Rochester, at the Mercer Gallery at Monroe Community College. From there it sprung from the east coast to the west landing in Seattle, WA at the Form/Space Atelier and the meandering down to San Francisco, CA, at the Madrone Studios. 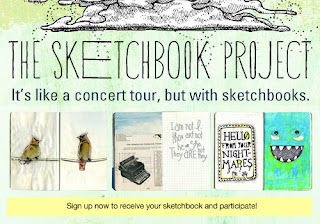 The Sketchbook collection then skipped mid north to Chicago, IL, at the Hyde Park Art Center. The final stretch of the tour culminates tomorrow at Full Sail University in Winter Park, Florida. Art House Coop is a started as a community based arts space out of Georgia. The brain child of Steve Peterman and Shane Zucker was conceived while they were still undergrads at the Atlanta College of Art. It has exploded into a national event with international participation. It is now housed permanently in the Williamsburg section of New York with the creation of the Brooklyn Art library, a library consisting of just sketchbooks from artists worldwide. Next year’s project will be going international. Break out the pencils or crayons and sign up! Maybe the Blue Horse Arts Studio will be on the schedule! We’re working on it! The Melon Kali Flowers Tonight! The Melon Kali Flowers, are playing from 7-9PM tonight at Maggie McFly's in Middlebury. Come Check out Jay Foster's side project and be entertained by Alex Alves! Right here in Connecticut we have an excellent resource for those interested in the art of natural history. 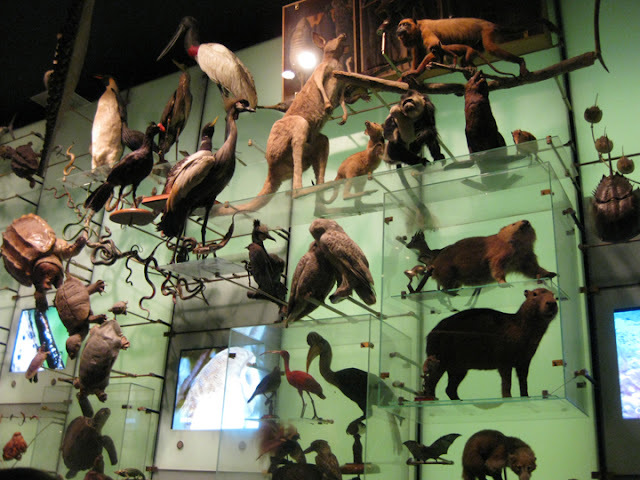 The Yale Peabody Museum is a jewel in the crown of Connecticut museums. In a recent article in Connecticut magazine, I was pleased to see that the Zallinger piece was on the list of top 10 of works to go see. This is a heartening change in the wind of contemporary attitudes towards what is considered important work. The painting by Rudolph Zallinger, “Age of the Reptiles,” is a classic in the art of natural history painting. The fresco mural took about three years to complete. During that time Zallinger underwent a crash course in paleontology and comparative anatomy. Because of his research in the painting and the importance it held as a contribution to the field of natural science, Zallinger was the first nonscientist to receive the Addison Emery Verrill Medal, an award that honors individuals in the arts of natural history and the natural sciences. The museum's website and exhibition provide excellent information on the how the work was conceived and executed. 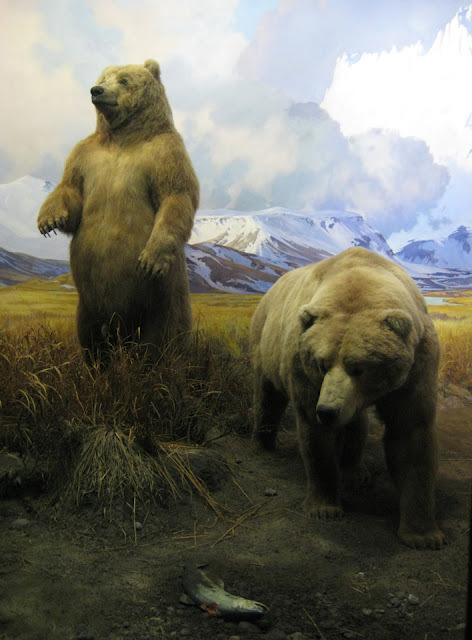 Other artists have influenced the direction of scientific study in the field of natural history and also in the fields of medicine, both veterinary and human. Georges Stubbs’ engravings and research into the anatomy of the horse greatly influenced veterinary procedures on horses at the time. Likewise in contemporary medicine, cardiologist Frances Wells of Papwell Hospital in Cambridge, has used Leonardo DaVinci’s anatomical drawings of the heart as a direct inspiration for a pioneering mitral valve repair procedure. The list is long both for the interaction of art to science and vice versa.I believe strongly in the training of observational drawing for science practitioners and those interested in a possible career in those fields. I studied for a year and a half at Paier College of Art in Hamden and the Peabody was the destination of choice when understanding part of the legacy of instruction there. The museum is a rich resource for artists seeking research subjects. 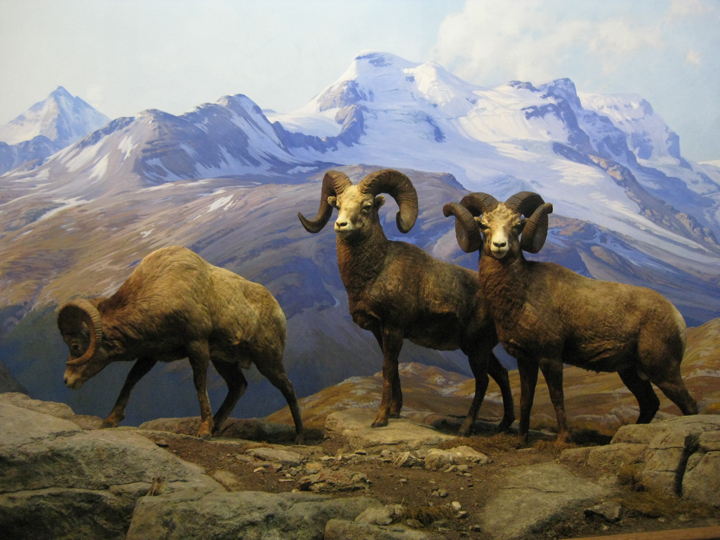 The dioramas and taxidermy are more intimately accessible for study than the American Museum of Natural History. It is less crowded and one can get closer to the specimens.The only drawback is it is bit dark for drawing in some of the areas. It also contains a number of excellent landscape backgrounds by painter James Wilson Perry. 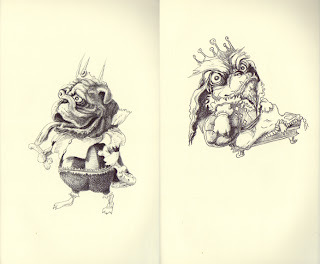 Alexis Rockman- work informed by natural history representation and the confluence of art, science and culture. Very Weird stuff from the early 1900's. 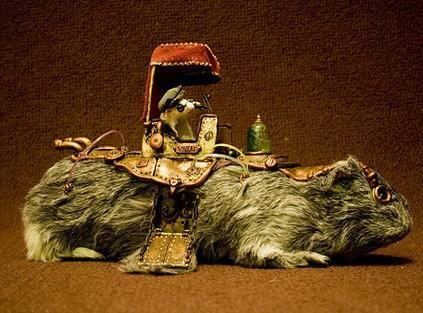 Lisa Black- Pretty creepy contemporary steampunk version of taxidermy. Today, according to the Google Doodle, is the 113th Birthday of Alexander Calder. Calder was a longtime resident of Roxbury, Connecticut. He is most well known as the highly influential 20th century sculptor and originator of the sculptural forms of the Mobile and Stabile. A local metal fabrication company, Gowans-Knight Co. had a hand in assisting Mr. Calder in the fabrication of his sculpture. 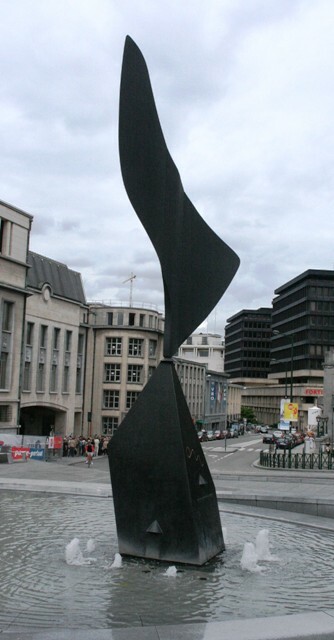 The monumental sculpture titled the Whirling Ear manufactured in Watertown, Connecticut was placed in the at the U.S. pavilion for the 1958 World’s Fair in Brussels. I had the happy occasion to greet a friend from Singapore last Saturday. Ren Rong Chong or Chong Ren Rong depending where you are from! Came for a visit to N.Y.C. Ren is interning at UCLA as a concept artist, interactive designer and illustrator. I have the privilege of calling her a former student from my first year teaching in Singapore. She got a chance to peruse the east coast art scene for a few days last week and met in the city. 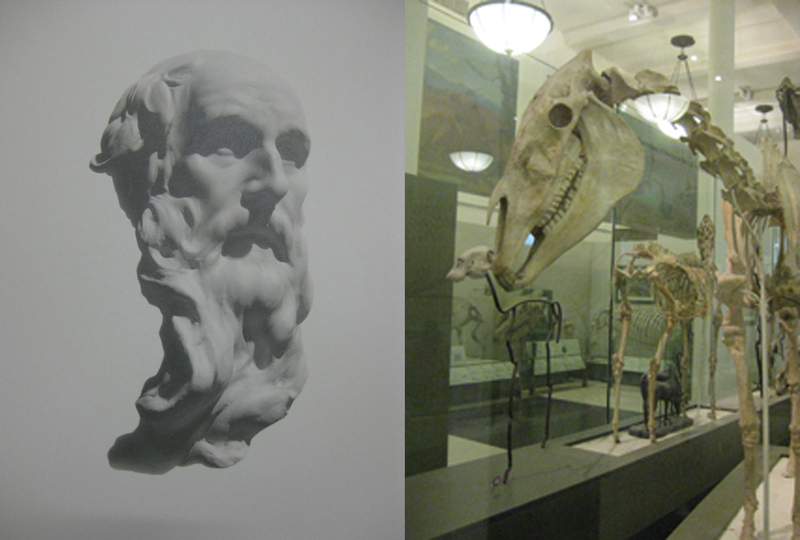 We traipsed from the cast hall of Grand Central Academy to the Fossil halls of the American Museum of Natural History. The intention was to do some drawing from the animal dioramas in remembrance of our zoo drawing excursions in Singapore. Alas we ran out of time before I had to catch the train back to Connecticut. It takes far more than a day to take in the vast amount of information and exhibition that is on display. 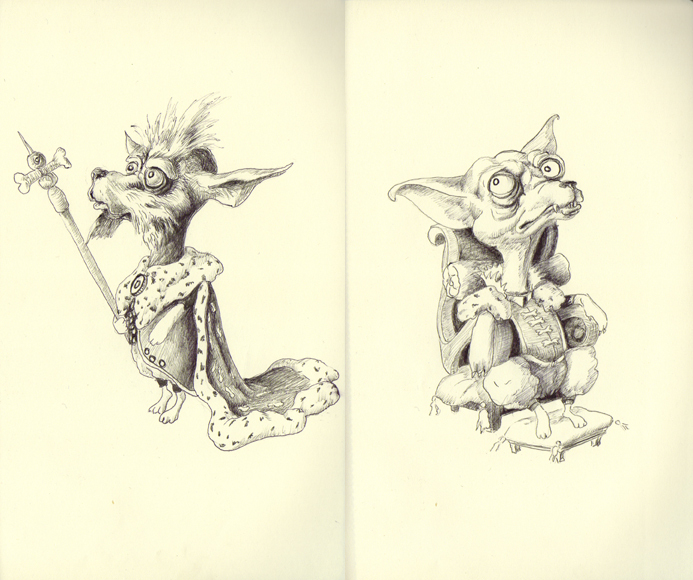 I’m definitely going back for some drawing /research in the next few weeks. 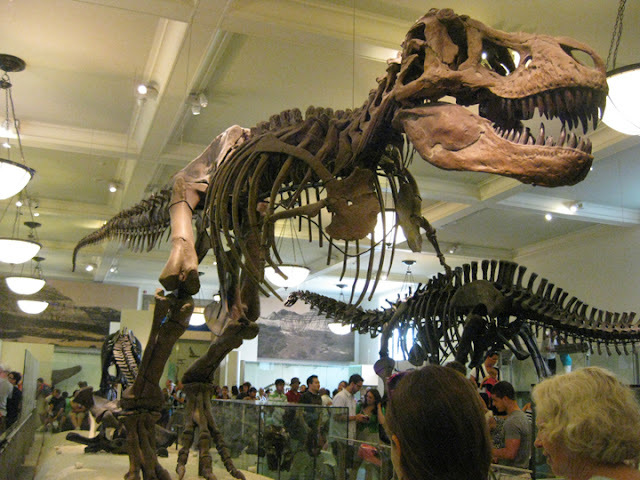 The AMNH is Mecca for Natural History buffs and artists interested in any aspect of that subject. 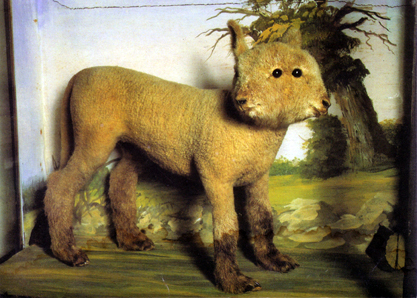 The diorama paintings are exquisite. 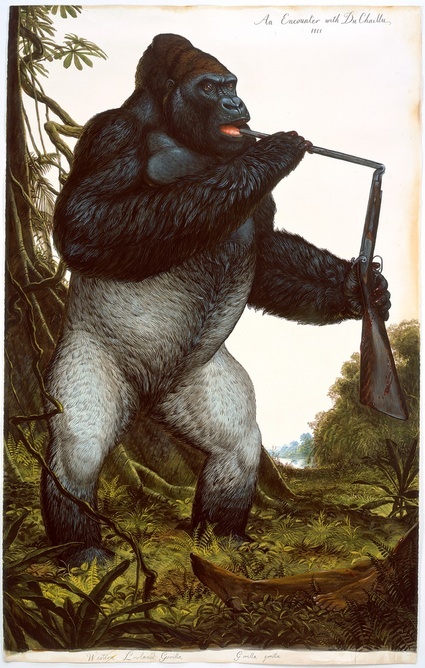 They have been executed by a number of great painters and scientific / wildlife illustrators since the late 1800’s. I hadn’t been aware that Carl Rungius had worked there until recently. Being a fan of western Wildlife Art this was an interesting find. The art of Robert Bateman and the late Bob Kuhn in particular, have been interests of mine when I just started out and still continue to be. I was lucky enough to be invited to Bob Kuhn’s studio in Roxbury, Connecticut for a critique and counsel just before he relocated to the South west. I was looking for an apprenticeship after art school. He was an incredibly generous man and I am forever grateful for that opportunity. The museum’s role has evolved through the century continually expanding in its collection and scope. The Center for Biodiversity and Conservation was founded in 1993. It is serves as a research center for biodiversity with a mission to influence public policy and educate citizens on the critical need for stewardship of our earth. 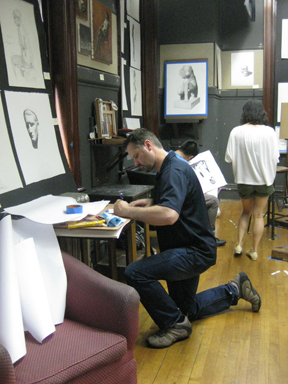 I’ve been working down at Grand Central Academy with Scott Waddell this past week furthering my study of classical drawing. Scott is an amazing artist and excellent instructor. I have found that to be the case with the entire faculty that I have encountered there. The program is based on the rigorous study of form and perception built upon the training of the 19th century French academic tradition. Though based on pedagogy from the pre-modern era, one would be very remiss in thinking that this school is purely reactionary or closed in its thinking. The artists there, both students and teachers, are extremely talented and come from a variety of backgrounds. Artists who work in abstraction, educators, animators, interactive designers, and illustrators to name a few of the professionals that I have come across in the forest of marble casts. All with attention lasered on the tip of a needle sharp pencil. Check out Scott's website at www.scottwaddellfinearts.com. The summer workshops offer an opportunity for rigorous study to those who are not able to attend the full four year program in New York City. Artists come from around the world and throughout the U.S. to study there. In this summer session alone I have met artists, both students and professionals, from Spain, Thailand, Portugal, Canada, Idaho, Florida and California. Previously I have met artists from Australia, Brunei, Mexico, and Germany, along with myself traveling from Singapore at the time. This place is Nirvana to those who relish the slow pursuit of excellence in an intellectually stimulating and supportive environment. Did I mention slow? The figurative drawing convention of the 20 minute pose falls by the wayside here. 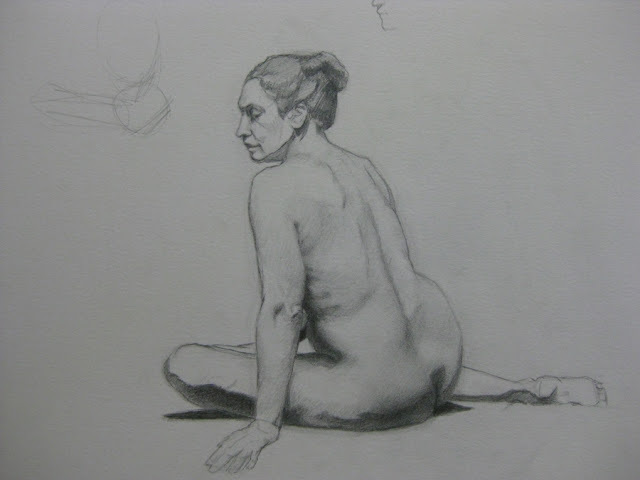 Most figure studies are approximately two weeks to a month in duration. All day. Five days a week. There is a great article on Jacob Collins in the June 27th issue of the New Yorker Magazine by Adam Gopnik. 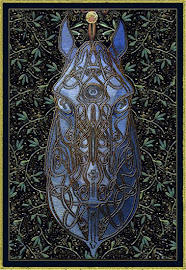 Jacob Collins is the founder (and an artist extraordinaire!) of the the Water Street Atelier which eventually grew into The Grand Central Academy. Happy 4th of July: Celebrate Independent Thought! If you are in the Lakeside/Morris Connecticut area you should really check out the art car parade at Lorenz Studios today!! This annual event of hipsters, artists, musicians, and innocent bystanders has been going on for decades! We were there for some of the event yesterday with our friends from the band “Electric Bakery”. Jay sat in for part of the gig. I met a cast of interesting Creatives (waste vege oil fuel experimenters, glass blowers, balloon artists, and poets of the road. Talk about getting back to my roots!). Larry Lorenz is an amazing glass artist and sculptor. He maintains his working studios by the roadside in Lakeville, CT. Locals around here are familiar with his pasture gallery of mixed media sculptures (the Elephant being the most infamous! ).From what I can tell there will be a Clean Energy event held this coming Labor Day. Should be interesting to those into sustainable and alternative fuel technologies! There are demos of some glass work techniques held in the barn studio during this three day music event. It’s a beautiful day, check it out! And the band keeps playin' on!